With a whopping two billion cups of coffee drunk every year across the world, coffee is often described as the most favored drink of all. It’s not surprising, it’s delicious! Coffee has a smooth, rich, velvety flavor and distinctly chocolatey aroma, it’s soothing and comforting but it’s also the best drink available to get you going! The caffeine content alone makes it a very popular breakfast beverage because it’s a natural stimulant and excellent for kicking a sleepy brain back into gear! There are different types of coffee too, light roasts to very dark roasts as well as different qualities to take into consideration (notably Arabica and Robusta beans) and there are also plenty of variants to coffee drinks. We are talking about short, sharp shots of double Espresso, super tall macchiato, long, dreamy latte or perhaps a frothy, fun cappuccino to name just a few. Coffee is entirely personal too; some people like it dark, acidic and black and others prefer to drink theirs as sweet and creamy with plenty of milk. That’s one of the reasons why the world over loves coffee – you can enjoy it in so many ways, making it an extremely versatile drink. As you stare into your own cup of coffee, have you ever wondered how that lovingly prepared cup of coffee actually originated because that steaming cup has come to a lot further than just from your coffee machine! 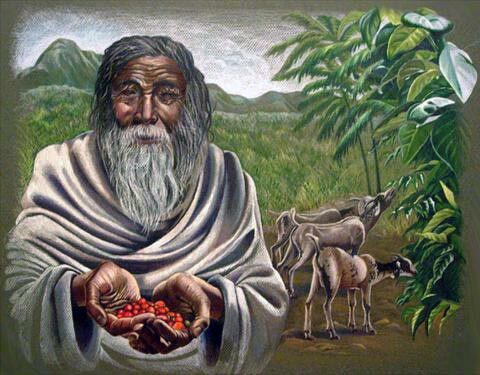 The Ethiopian Kaldi was supposedly the first person to ever have a cup of coffee and that was back in the 9th century when he noticed how his goat was nibbling away at cherries on a coffee plant. He saw how animated they became after their snack and tried it himself! So we have to thank him. His remarkable discovery soon made waves across Africa, into Asia and then into South America. Today, Brazil is the largest exporter of coffee ($5.15 billion, approximately) but coffee is grown in many places, mainly in Latin America, Eastern Africa and parts of Asia and that’s because their climates are ideal for coffee growing. From seed to cup takes anything up to 5 years but what happens during that process? Coffee beans come from little, tiny seeds and those seeds once planted, germinate into coffee plants. 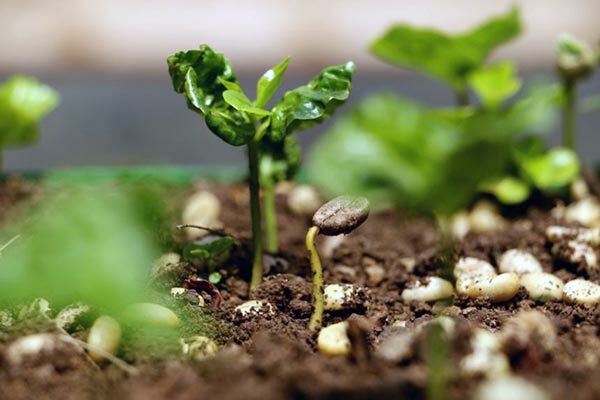 Coffee seeds must be planted in the right type of environment for them to survive. That’s why coffee isn’t produced in Europe or most parts of North America. The climate needs to be hot and the soil needs the right type of drainage to make sure that coffee beans grow healthily. Coffee seeds need to be watered daily but the amount of water must also be precise because too little water dehydrates the seeds so they die out and too much water drowns seeds. The soil needs to be well-drained, so the water doesn’t ruin the roots too, although the soil must feel moist (but not soaked). Soil also needs to have a low ph. and high nitrogen content. So as you can see, where coffee grows is vital to its quality and whether or not it survives to end up with a successful coffee harvest. Coffee seeds are sowed in large, shaded beds in the right conditions. They take a long time to sprout, up to 2.5 months. A few days after sprouting, the seedlings are moved into individual pots with the right type of soil that is perfectly prepared to give them the opportunity to grow well. While seeds need to be in a hot climate, the seedlings also need protection from the sun, so they are left in a shady area and given plenty of water until they are robust enough to move into another growing area. Timing is also important and planting occurs during the rainy season which is when the soil is moist enough to really give the roots what they need to establish themselves. Harvesting usually occurs once a year, however, some countries harvest twice, with the main harvest and the secondary harvest. Good examples of where this happens are Columbia and Kenya in South America. 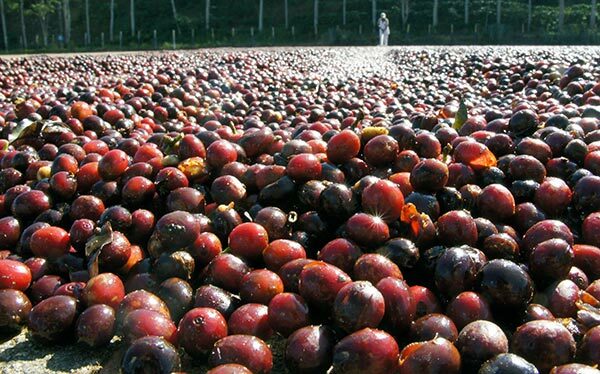 The first harvest, at the beginning of the season, gives a poorer quality coffee flavor. 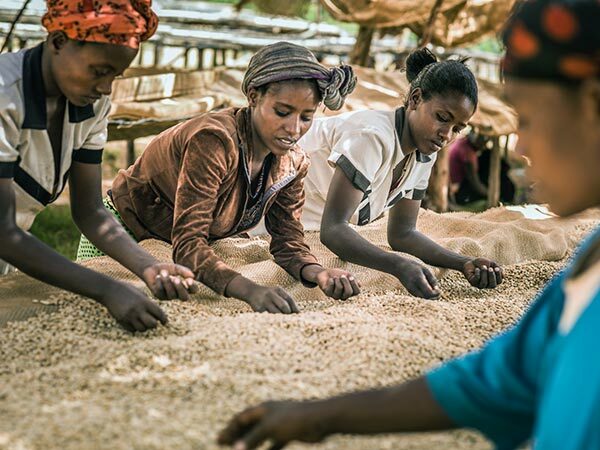 The second harvest delivers a great tasting flavor coffee and that’s why the best roasters insist on purchasing their coffee from the second harvest. 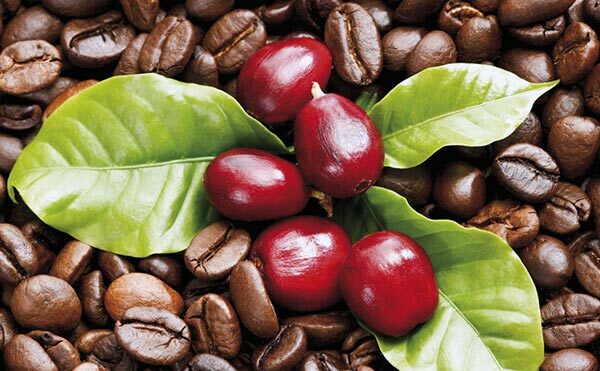 It takes approximately 3.5 years for a coffee plant to produce fruit. That fruit is called “cherries”. Cherries have to ripen too. In the beginning, they start off as green (unripe) and slowly become red. That shade of red varies from bright red to deep red. Depending on where the coffee plant is planted makes a difference to how quickly cherries ripen. Plants that are positioned in a low altitude environment with a hot climate ripen faster. Coffee cherries are often hand-harvested and this makes sure that the ripe cherries are picked rather than every cherry (if the latter happens, unripened cherries also fall into the mix). It is a hard job when undertaken by hand. It takes time and it’s a job that must be completed by people with a keen eye and plenty of patience as every cherry must be checked to make sure it’s ripe enough to harvest. There are also some instances where cherries are machine harvested, this usually happens on large farms. Brazil is an example of a country that favors machine harvesting. Selective Picking. This is a more labor-intensive process that is usually used for the better quality Arabica coffee beans. The red cherries are hand-picked as they are ripened, and the unripened cherries (green) are left for further ripening. This type of picking occurs every ten days. Strip Picking. This picking system uses machine or hand and cherries are stripped off the branch (both ripe and unripened). This system is a lot faster than selective picking but doesn’t produce as high-quality coffee as ripened cherries are often mixed in with unripened cherries. This is an age-old process that has been used for centuries by coffee farmers and takes a few weeks. It is particularly popular in areas with little water availability and on small coffee farms. Sometimes, it’s referred to as “natural” or “unwashed” cherry processing. The method involves ripe, fresh cherries laid out on a large surface in the sun where they’re left for up to three weeks to dry out. The beds are raised from the ground allowing for good air circulation. During the three weeks of drying, the berries are regularly turned and raked to stop them fermenting and to make sure they dry out evenly. At night, the berries are covered to prevent moisture entering which deteriorates their quality. Once the cherries are dried, the outer layer of each cherry turns black and goes very hard, this is integral to the harvesting process as it allows for the outer skin to be removed easily. 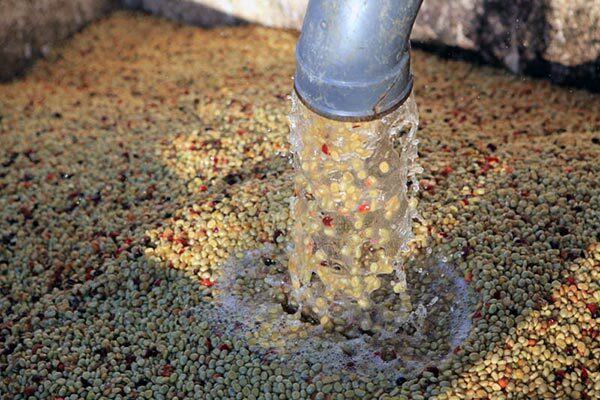 This method is newer and uses water to extract the coffee beans from the cherries. It is an intensive process that starts with cleaning the cherries and getting rid of unripe and overripe fruit. Once that is complete, cherries are pushed through a special machine that is called a “pulping machine” which squeezes out the skin. Any cherries left with their pulp still on are removed but they can still be used, however, only for a lower grade coffee. Once the coffee cherries are pulped, they produce a sticky substance (mucilage) which is placed into large tanks with special enzymes added. The enzymes help the stickiness to be removed and the beans are regularly stirred to make sure all the mucilage dissolves. It’s really important to remove all the mucilage so the beans retain all their flavor. This takes an entire day and after all the mucilage has dissolved, the beans are repeatedly cleaned to get rid of any residue. Then, the beans are dried out in the sun for a couple of days. Once dry, the beans are sorted into order of quality. At this stage, the coffee beans are referred to as “parchment coffee”. The next step is coffee milling and the coffee parchment is hulled. This involves getting rid of the beans’ dry husks (known in the industry as exocarp, mesocarp, and endocarp). They are also polished although sometimes, this step is missed out entirely. Polishing gets rid of any silver skin that might still be visible. It’s worth noting that polished coffee beans are sometimes seen as higher quality than their unpolished brothers but this is not necessarily true. After the milling stage. The beans are sorted and graded depending on the size of the bean and its weight. Polished beans are checked for inconsistency in color and any visible flaws. This is done by humans so it is labor intensive and can take many hours. There is a mechanical method that uses an air jet which separates lighter weight beans from heavier beans. It works by pushing beans through a number of screens that have holes in them. Only certain size beans will pass through the holes and the lower quality beans are used for a lower grade coffee. 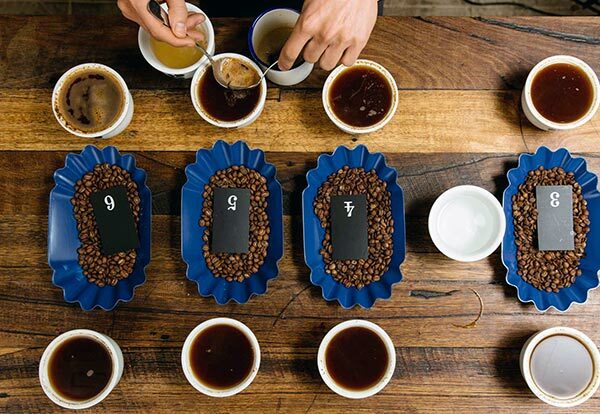 The graded coffee is then packed and during each packing stage, regularly tasted to check the flavor and quality. This is called Cupping and there is a special room specially designed for tasting the coffee. The coffee that you enjoy is made out of beans that are roasted. Unroasted coffee is known as green coffee and retains all its wondrous flavor. Roasting changes green coffee into brown beans – those you’re used to seeing in coffee shops or at your favorite coffee roasters. Roasting (referred to as pyrolysis) uses temperatures of 290 Deg C and during the process; beans are turned continuously to prevent burning. First, the bean turns yellow and the roasting aroma starts to really envelop the senses, then once the bean reaches an internal temperature of around 200 Deg C, it grows to double its size, turning from yellow to light brown. The color keeps changing as the temperature rises until it goes a rich brown and releases caffeol, its own special oil. 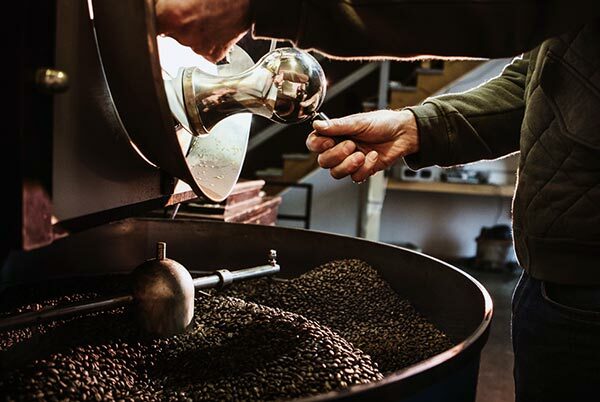 The roasting process gives the bean its flavor and aroma. The darker the bean, the more intense the roast. Once roasting is finished, beans are immersed in water to cool them quickly. 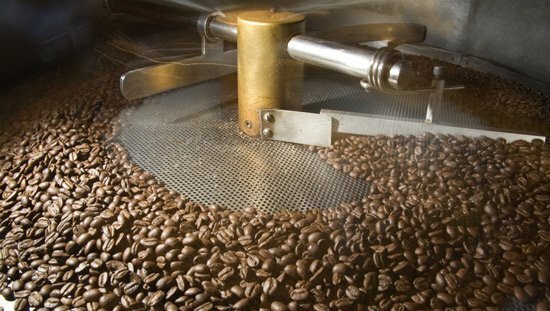 Roasting is an art and often takes years to perfect which is why coffee roasting is only completed by experts. Beans are usually roasted close to where the consumer buys them and that’s because once roasted, beans slowly deteriorate. Your own favorite coffee roaster will probably perform the process on-site. Some people even do it at home. Next, it’s grinding down the coffee beans and the reason why coffee is ground is to really enhance the flavor of the cup of coffee. There are different types of coffee grinders and each determines how quickly coffee releases its flavor, for example, espresso coffee is extremely finely ground but coffee made with filter coffee maker is coarsely ground. 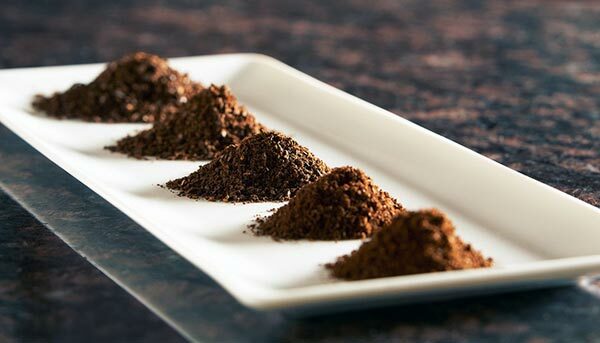 The packaging of any coffee, roasted or ground is especially important as exposing coffee to air poses quality issues, especially for ground coffee. Once the coffee is exposed to air, it starts to lose its flavor very quickly and that’s why coffee is generally packed in airtight jars or bags. It is very important that once a pack or jar is opened, it is re-sealed as quickly as possible and stored away from sunlight as sunlight exposure also impacts flavor. 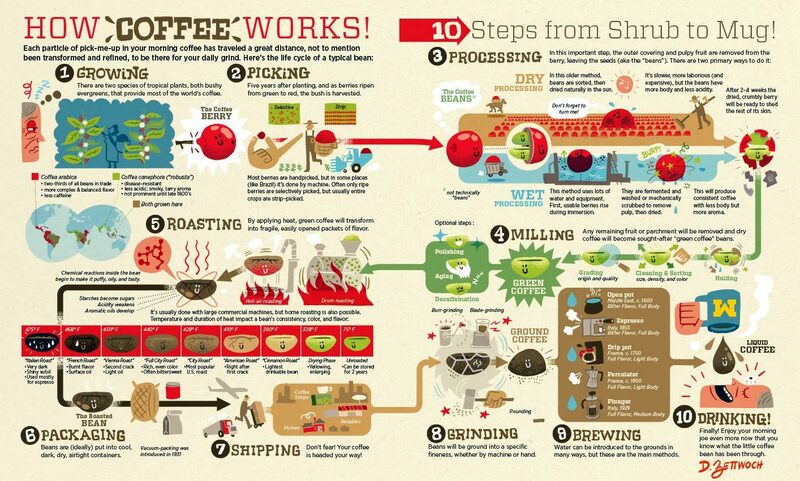 So now you know how coffee is prepared, from the very start of the process to drain the contents of your cup. That cup of coffee you’ve just enjoyed has taken years to reach you, in some cases more than 5 years! That’s why you should always savour every last drop. Next time you make your coffee, think back to that little tiny seed and where it was first planted and imagine its journey from seed to cup. 10 A Final Coffee Note…!